Angel ornaments for Christmas tree decor are so popular. This one is especially nice as it shimmers and glistens. Measuring 4 ?" long x 3" wide, each is made of a silver pewter colored poly resin with a detailed ivory inlaid enamel design, in a classic angel shape, accented with glistening rhinestones for a dramatic effect. Each has an ivory satin ribbon tied at its top for easy and stylish hanging. 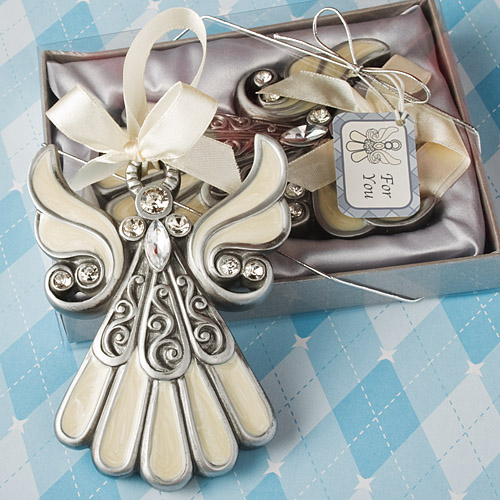 Each ornament favor comes nestled in silver satin inside a textured silver gift box with a clear acetate display top, wrapped and tied with a silver metallic elastic cord and an attached angel design "For You" tag.